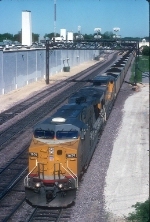 Description: Lead engine on a BNSF baretable reposition train. Title: UP 7059 "We will deliver"
Description: I love the carrier deck look of the AC60CW. Description: M-PRPR 05 sits at the south end of the Janesville, Wisconsin Yard awaiting a crew with a nice surprise in the consist on August 6, 2013. Consist is UP 9447, UP 9454, UP 1983 (WP heritage unit), UP 6323, UP 7059 and UP 1430. As far as I know this is the first heritage unit to make it north of Harvard, Illinois all the way to Janesville, Wisconsin on the UP's Harvard Subdivision. UP 1983 came in yesterday morning on an empty grain train. Description: Approaching signal 175-6 on UP Roseville (Donner Pass) Sub. WB. Description: A westbound loaded Union Pacific coal train rolls through Stockton led by AC4400CW #6829 and AC4460CW #7059. Description: Union Pacific AC4460CW #7059 trails on a westbound loaded Union Pacific coal train as it rolls through Stockton.